On Memorial Day, we took a family hike up Kephart Prong trail, located in the Great Smoky Mountains National Park. We didn’t have big expectations since the trail was just a simple out and back trail with no waterfall or exciting destination, but this trail turned out to be one of our favorites. Read all the details about our hike up the trail and see lots of photos. Directions: From Oconoluftee Visitor’s Center, travel 7.3 miles on Highway 441 (Newfound Gap Road) towards Gatlinburg, TN. The parking area will be on your left. From Sugarlands visitors Center, travel 21.8 miles on Highway 441. The parking area for the trailhead will be on your left. Recommended Gear: Digital camera and other day hiking essentials. There are also some great wading areas in the water, especially for kids, so we would recommend maybe bringing a few towels, bathing suits, and some water shoes. Kephart Prong Trail begins by crossing the absolutely gorgeous Oconoluftee River which runs along side Highway 441. The crossing is via a large metal bridge from the parking area. The end destination on this hike is the Kephart Prong Shelter, located 2.1 miles up the trail. The trail begins by following alongside Kephart Prong, which flows into the Oconoluftee River. Kephart Prong makes for some absolutely gorgeous stopping points along the trail for taking a break, enjoying the sounds of the water, and for taking photos. Roughly 0.2 miles along the trail, you’ll come to an old stone sign. The sign, and a few other historical items in this area are what remains Civilian Conservation Corps (CCC) camp. The camp was created in 1933 and used by the CCC until 1942. The CCC workers (about 200 of them at this camp) built roads, parking areas, created the water system for Newfound Gap (still in use today), built trails and trail bridges (including the one’s you’ll cross on this trail), controlled erosion issues, and even fought fires as required. A fish hatchery was even constructed here to help replenish the fish in the streams and rivers of the park so damaged by the massive logging operations in the area. During it’s use, the camp contained: A barracks, an officers quarters, a recreation hall, mess hall, a few other miscellaneous structures. The two most notable remaining structures are the stone chimney, stone sign, water fountain and what appears to maybe be an old well or water pump. The best time to see the camp is in the winter, when the vegetation is limited. During World War II, the camp was occupied by conscientious objectors (called “conchies”). Conchies were against the war, but were still expected to serve their country. Some were assigned to the Kephart Prong camp to take over some of the work being done by CCC members, along with teaching park ranger children, and many other activities. We spent about 15 minutes exploring around the camp and finding old water pipes, foundations, and various metal and small structures. We also found a wild hog trap in this area set-up by the National Park association, which we steered clear of. Once we finished exploring the camp, we continued on up the trail with the Kephart Shelter as our destination. The first part of the trail is a very easy hike, with only a slight incline as you ascend Mount Kephart. The trail follows along Kephart Prong, and frankly is just beautiful. The forest floor is lush with various bright green plants, undergrowth, trees and wild flowers. 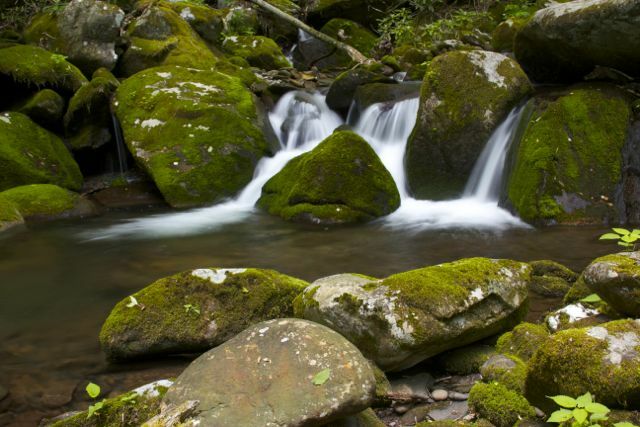 As you walk up the trail, you will literally find yourself surrounded by many shades of green with the constant sounds of water flowing along Kepart Prong. While this might sound a bit silly, this trail is almost magical, almost taking you to another place as you walk. Through most of the trail, the forest canopy completely engulfs you, and in some places so much so the forest becomes dark, even it broad daylight. Along the way you’ll run across many different photo opportunities along the trail and water. Along the lower portion of the trail shortly after leaving the CCC camp area, you’ll note a large concrete box on the left. This is most likely the cistern for the CCC camp. You’ll soon run into the first of four log bridges you’ll cross on your way to the shelter. Our kids always enjoy crossing these. The foundations you see were built my the workers at the CCC camp you passed through on the early part of the trail. Amazing that they still exist and continue to work nearly 100 years later. An old railroad used to run through the area as well, most likely a remanent of the pervasive logging operations that occurred in this area in the late 1800s and early 1900s. Horace Kephart, who the mountain and trail are named after, was one of the instrumental people in the formation of the park. The park was created in part to help stop the forest from being decimated by the logging operations. 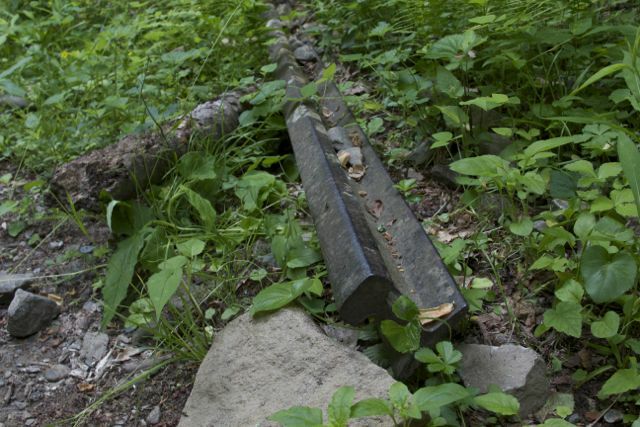 As you hike up the trail, look for remnants of the old railroad, including old rail and spikes. We found old rail in two different places, directly beside the trail (see the More Photos section below). As the trail transitions into the second mile, the climb becomes a bit more steep. Not significant, but enough to where you will notice it. The last quarter of a mile to the shelter is the toughest part of the trail, but still only moderate. After a fairly straight climb, you’ll round a bend and see the shelter to your right. This is the intersection of Sweat Heifer Trail, Grassy Branch Trail, and Kephart Prong Trail. When we arrived there were a number of people hanging out at the shelter, so we continued past it to another log bridge crossing, and sat down there by the creek to eat some lunch, drink some water and rest. Once the shelter cleared out a bit, we took the time to explore in and around it. Kephart Prong Shelter is a really nice shelter, with two tiers of bunks, a fireplace, covered camping area, and outdoor seats and fire pit. There is a also a clearly marked “toilet area”, but don’t get too excited, it’s not a restroom facility, just a clearing in the woods. Also at the shelter is a good water source, though the park recommends boiling it before drinking. The shelter also has a number of food lines to hang your food items up at night to avoid attracting bears. After we finished exploring, we headed back down the trail and to our truck and the parking area. The trip down is much faster and easier. We were pleasantly surprised by Kephart Prong Trail. This absolutely gorgeous and easy to hike trail is great for families with small children, beginning hikers and senior citizens looking for easier hikes. We would highly recommend this trail for photographers too, especially if you like taking photos of water like we do. We’ll be adding this trail to our list of family favorites.